Great Price as a Antique Belt Buckle!!! 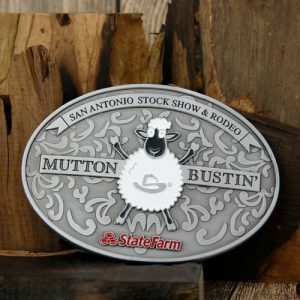 Mutton Busting is an event held like rodeos. This is very similar to a bull riding or bronc riding, but, instead, young children ride or race a sheep. Fantastic right! In the event, a sheep is held still, while a child is placed on top in a riding position. Once the child is seated at the top of the sheep, this one is released and usually starts to run in an attempt to get the child off. There are no set rules for mutton busting. These types of events are locally organized, so usually there are not national organizations for bigger competitions. Majority of children, are required to wear helmets and parents are often asked to sign waivers to protect the rodeo from legal action in that event. 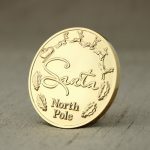 As a Family activity to make children happy, often small prizes or ribbons are given out to the children who can stay on the longest. The participant with longest time on the sheep wins, most of them fall off in less than 8 seconds. Age, height and weight restrictions apply on participants to generally prevent injuries. Supporters consider the event both entertaining and a way to introduce young children to the adult riding events. Mutton Bustin Antique Belt Buckles are used to celebrate this event. There is a sheep in the middle of mutton bustin buckles full of white and black. 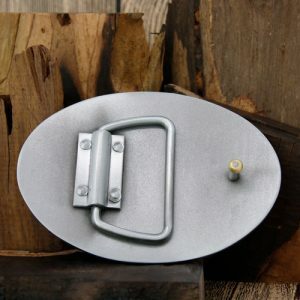 Antique Belt Buckles are crafted by antique silver. 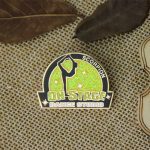 GS-JJ can help you with design and offer you many different antique belt buckles and belt buckles​ at a very affordable price.